1)	Try it on everything! - Try it for physical pain, emotional upset, a disturbing or traumatic event and even try it on inanimate objects. Do not limit yourself. 2)	Be highly specific - describe a specific event in detail. Describe where a pain is and identify exactly what it feels like. 3)	Persistence pays - keep at it. 4)	Don't get hung up on doing everything exactly right. If you miss a point  so what. The wording can change. You can skip points. You can alternate positive and negative phrases as you tap. In other words, there is a lot of leeway. You will find that some people use different points than others. Go with what works and feels best for you. While sitting on the throne. While waiting on the phone. While riding in a car. While waiting at doctor or dentist offices. While waiting at the hair salon. While waiting to pick children up from activities. While sitting at the computer - quickly type statements you feel you need to tap on. While laying in bed at night before going to sleep. While laying in bed first thing in the morning before getting up. While waiting for a movie to start or a cultural event to begin. While riding a commuter train to work. 6)	Tap on another person. When working with someone else and they aren't ready to tap yet, just tap on them while they talk about their troubles. Ask permission first. 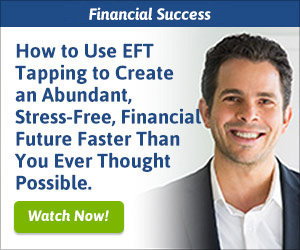 7)	Variations - There is more than one way to do EFT. Touch and Breathe - touch a point and take a deep breath while thinking the statement or phrase. Tapping in your mind - picture tapping the points in your mind while saying the phrase or take your intention to each physical point and say the phrase in your mind. 8)	Approach situations from different angles asking about specific objects, sounds, feelings, emotions, physical reactions (ex. racing pulse), etc. Work on each aspect thoroughly. 9) Don't let the one-minute wonders lead you to think that everything is quick and easy. On the other hand don't let the frustrating issues that require patience and perseverance lead you to think that nothing is easy. Every situation is different and it is not always known whether an issue will be easily collapsed or turn into a comprehensive case.